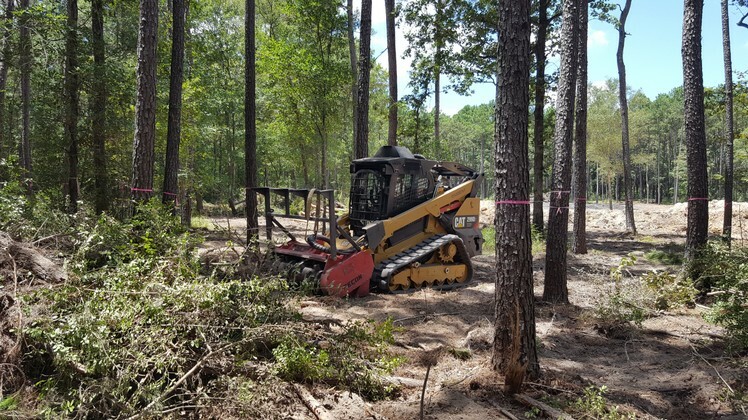 In the land clearing industry, hydro-ax mulching has introduced a highly efficient method for clearing out trees, undergrowth and more in a fraction of the time. Also known as hydro-axing and simply hydromulching, this technique uses powerful machinery to quickly turn trees into mulch where they stand. Rather than the outdated method of bulldozing an entire space of land, hauling away the debris, disposing of it, and then possibly repairing damaged soil, hydro-axing completes all of these steps at once. With hydro-axing from Texas Ace Land Clearing, trees up to 12 inches in diameter are removed in a matter of seconds. In addition to quickly clearing large areas of land, this machinery offers superior precision in removal, so you can quickly create walking trails, hunting access roads, riding trails and more. At Texas Ace Land Clearing, we are glad to provide free assessments to offer you a personalized review of your project and an accurate quote. Schedule your appointment with Texas Ace Land Clearing today to discuss the details of your hydro-ax mulching needs.